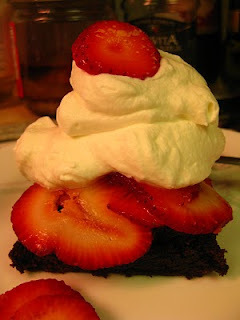 Amazingly indulgent, we whipped up a batch of these for dessert last night. Being, well, me, I wanted to throw some espresso, or bacon, or vodka into the mix, but I was chastised by my "normal dessert" loving family and thus settled for a nice sprinkling of pink hawaiian sea salt baked into the top crust of the oooey-gooey fudge-y brownie. We opted for the quick and easy, Duncan Hines Fudge Brownie box. Halfway through cooking I added my little splash, and when we pulled the warm tray out of the oven, the salt had melted very nicely into the brownies. Topped with a hearty portion of sliced strawberries in sugar, and freshly whipped cream, this was the perfect combination for a warm summer evening.